How Do I . . . Get a Library Card? 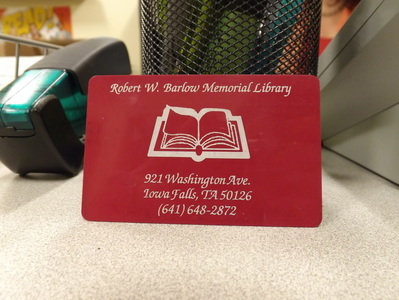 Residents of Iowa Falls and surrounding communities are eligible to obtain a Barlow Memorial Library card free of charge. Anyone applying for a card must apply in person. A picture ID with a current address is required, or a second form of ID with the current address will also be required. A second form of ID can be: utility bill, voter registration card, a piece of mail with a current address, or a post office change of address form. Ellsworth Community College students may obtain a library card with an ECC student picture ID card while providing their on campus (dorm) address. If the ECC student lives off campus, they must provide their ECC student picture ID plus a second form of ID (see above) listing their current address. Library cards will be issued to anyone who can present verification of their address and who are at least age six years old (with a parent/guardian). A child who wants a library card and is age 6-17 will need to be present with a parent or guardian who will need to verify current address (see above) and fill out a registration form, which can be downloaded below.